Choosing to start your own business is a big decision, and it requires quite a bit of dedication and drive to make it a reality. 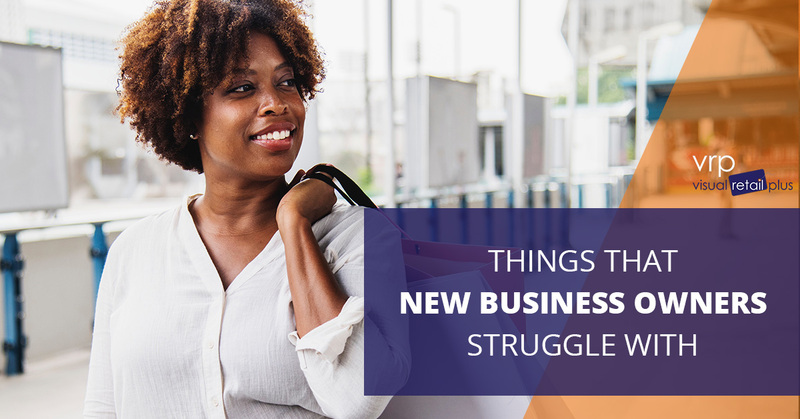 While you might have the passion to get your dream started, there are a lot of struggles that small business owners struggle within the first few months of opening. The team at Visual Retail Plus is made up of individuals that once owned their own small businesses, which is separates our point of sale system from the rest. It’s also this background that allows us to understand many of the struggles that new business owners are coming across. In today’s blog post we are going to cover a few of those struggles that so many business owners have a tough time with. Let’s get started! There’s something unique about every business, and it’s this quirky and one-of-a-kind component that needs to be advertised. Whether it’s in the quality of the product, the culture of your team, the individual that you cater to, or your mission statement, it’s this brand awareness that needs to be shared in order for your business to stand out. As a new business owner, it can be easy to come up with an idea that separates you from the rest, but implementing this idea and getting others to recognize it is a little bit more challenging. In the first few months of a business opening, very rarely do business owners recognize that this is the selling point that attention needs to be drawn to. By not focusing on the factor that differentiates you from other brands, you can quickly become washed out and lost in a sea of brands doing the exact same thing. For a business to be successful, there need to be customers. While this may sound like an easy problem to solve, finding a reliable and consistent customer base can be quite challenging. One thing that we want to make sure that you recognize, starter businesses will rarely pick up a large customer base right off the bat. For a following to be built, there needs to be something that makes people want to support you. More often than not, this is the unique and one-of-a-kind factor that separates you from other businesses. If you know exactly what it is that makes you and your brand so different, then you should be able to determine which audience is going to be the most intrigued by it. By starting at the differentiating piece of your business and working outward from there, you can ensure that you stay true to your brand and build a following of customers that care about what you stand for and will gladly get behind it. Don’t just wait for the customers to come and find you. Whether you’re a retail business or a restaurant, inventory is a crucial part of running a business. As they say: it takes money to make money. When it comes to your inventory, you always want to be smart in the amount that you’re ordering and how well you’re managing it. Finding a system that helps you is one of the best things that you can do for your business, and not just because it makes managing your inventory easy. Having a thorough understanding of your inventory is one of the best ways to predict the future of your business. If you’re aware of what’s selling or what is attracting customers, you can start dedicating time and money to more specific areas of your business to drive you more sales. This is one of the many benefits to proper management of inventory, but the list goes on and on. That being said, make sure that you look into inventory management systems and software and find one that speaks to your needs —- you’ll be glad that you did. Finding quality people to work for you is one of the most challenging parts of owning a business, especially when you’re just starting out. At this point in time, the dream is so new, and the passion is still fresh, but it’s hard to find that in any one individual that you’re interviewing for a job. These high standards can make it difficult to find anyone that’s qualified or lives up to your expectations. On the other hand, you don’t want to hire just anybody to work for your business. There are a lot of people that are looking for a job, but you always want to make sure that as you hire individuals to join your team that you are keeping the company culture and uniquity in mind. Hiring individuals that would support your business and product otherwise is always a good way to attract like-minded customers and work ethics. At the end of the day, don’t give up on the team that you’re building. It won’t happen immediately, but you’ll eventually find valuable individuals that believe in your dream just as much as you do. Becoming a business owner is no small feat. It takes time, money, dedication, and hard work. If you’ve put in the effort to make it this far, don’t let the challenges beat you. Reach out to the team at Visual Retail Plus and see how the POS and inventory management software that we’ve designed can help. From organization techniques, inventory management, sales tracking, and more, this software was truly designed for the small business owner. Contact our team today, and we would be more than happy to provide you with a demo of our software so that you can see how it can change your small business.